Final Fantasy: The 4 Heroes of Light (光の4戦士 -ファイナルファンタジー外伝, Hikari no Yon Senshi Fainaru Fantajī Gaiden?, lit. 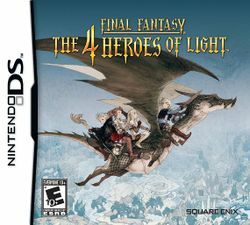 "The Four Warriors of Light: Final Fantasy Side Story"), is a role-playing game developed by Matrix Software and published by Square Enix for the Nintendo DS. It is a spin-off of the Final Fantasy series and was released by Square Enix in Japan in Fall 2009. The game was then released in America and Europe in Fall 2010. The game stars a boy named Brandt who, on his 14th birthday, is summoned by the king to rescue a princess who has been kidnapped by the Witch of the North. Producer Tomoya Asano has described the game as "a classic fantasy RPG using today's technology." Enemies are encountered randomly, and the turn-based battle system is reminiscent of the Final Fantasy games released for the Famicom, but uses a "Boost" command in lieu of traditional magic points. Up to four characters may join the party, with the appearance of the characters changing depending on the weapons and armor equipped. Also, like in the job system of past Final Fantasy games, players are able to freely select the characters' classes utilizing the "Crown System". This page was last edited on 1 August 2011, at 11:45.